It is almost "common knowledge" today that compassion is something that has to be taught -- that children need to hear, repeatedly, the deep concern in an adult's voice that comes with the urging to "see how sad Emily is when you hurt her like that" or "Peter wants to play with that, too, do you think you could let him have a turn so he'll be happy?" In the same way, many of the strengths of our favorite people are learned ones: vision, the capacity to take joy, serious valuing of life. 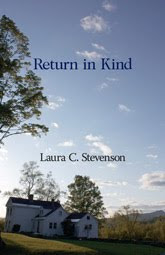 In Laura C. Stevenson's newest novel, RETURN IN KIND (Separate Star Publishing, www.separate-star.com), long lessons that take generations are framed in the landscape of southern Vermont, among farms gradually giving way to ski villages and vacation homes. With the death of college trustee Letty Hendrickson, Mather College, not far south of Vermont in the hills of western Massachusetts, will at last be allowed to mature into the co-educational institution it should long ago have become. A beautiful but single-minded and often unfeeling person, Letty has held back more than the college in her final time of illness -- her grieving husband Joel, already warned by friends that "relief" will be human and understandable, finds most of the certainties of his life suddenly unbound, shredded, without form, in the absence of Letty's force of personality. Perhaps most hurtful of all to Joel at this moment are the terms of Letty's will, which leaves all the treasures of her life -- at least, as far as Joel understands them -- to Mather College, and an odd old Vermont hillside farm to Joel. A farm, a landscape, that Joel never knew had a place in Letty's life, let alone in her will. Local gossip had it that her legacy was proof that she'd realized what she'd done to the college. But apparently his patience, his tolerance -- his love, damn it, his love -- had sheltered her from realizing what the legacy would do to him. If she'd only thought, for God's sake! .. But then thoughtfulness -- in any sense of the word -- had never been one of her virtues. With this depressing defeat, Joel leaves behind his long-time home and all its lovely artwork, furnishings, books, memories, to face the mystery of his crippled legacy in rural Vermont. I write "mystery" intentionally, for Stevenson provides one question after another, secrets folded into more secrets like rows of petals in an exotic flower. Joel, torn between grief and guilt and anger, finds a matching set of conditions in retired scholar Eleanor Randall Klimowski, whose progressive loss of hearing has cost her a career -- yet perhaps gained far more for her, gained her something that Joel is awestruck to observe and desperately afraid he'll never have. Stevenson's exploration of this landscape of hunger and heart is serenely paced and underlaid with a foundation of wisdom. In baring the framework built of loss and small acts of courage, Stevenson reveals how kindness and larger acts of courage take form in the soul and in community. And what more could she ask for? She slipped off her clothes, watched only by the reproachful eyes of her banished animals, and pulled her nightgown over her head, looking out the window. Outside, the rain had stopped, and the moon lit up the side of a fast-blowing cloud, then, suddenly, the whole range of mountains. She watched the harrowed pasture across the road turn silver through the faint reflection of herself, still beautiful in the inconstant light. And what more could she ask for? What she could offer him was as unlike the self she'd once been as the bulldozed field was unlike the wall, the orchard, and the trees that had once been. Stevenson draws the book to a deeply satisfying knotting together of the strands of discovery that pulse and glow throughout this carefully drawn portrait of life, love, and aging. From our losses, our loves mature and deepen. Stevenson reminds us of how tender this process can be, at its very best. Is this a mystery? No, it's not a genre book -- no sleuth, no exhilaration of a puzzle solved. But in RETURN IN KIND, there's an answer to some of the deepest mysteries of our lives. Most delightful to me is a growing conviction that here is a complementary and much-needed other half for the way that John Gardner (October Light) and Nicholas Delbanco have portrayed southern Vermont and its families in their novels. For the surprising twists of Stevenson's own life, prowl through her website, www.LauraCStevenson.org -- no magnifying glass or fingerprint kit needed, but a lovely look at how identity feeds her writing. Why the Surge in Scandinavian Mysteries? Nancy Drew/Hardy Boys: Better Yet, CITY OF SPIES!